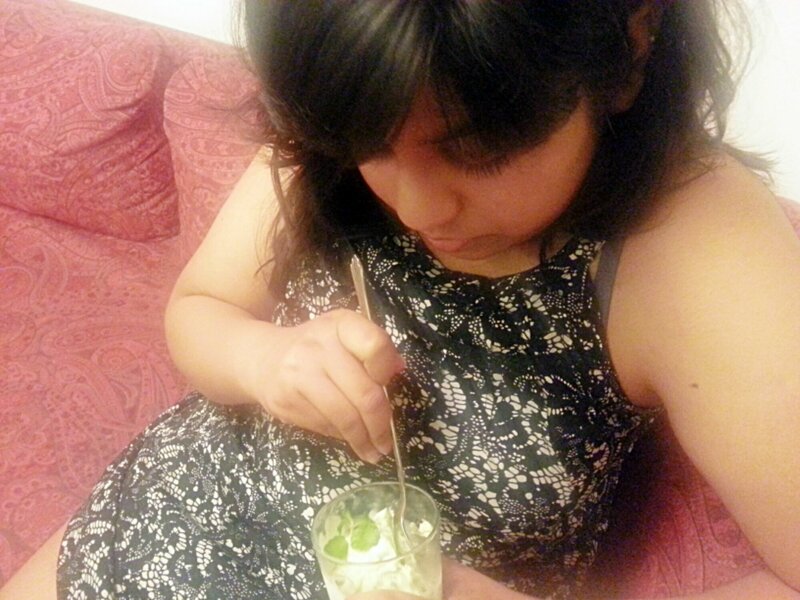 Finally I made my ice cream!!!!! 🙂 I am so relieved to have finally finished slogging with this I feel as if a chunk of load has been lifted from my shoulders! Yesterday this very recipe was driving me nuts but today thankfully all my hard work paid off and I didn’t have to search anything today things just simply fell in place! Although i have uploaded the recipe using the ice cream mixer but if you do get bummed in a situation like me where your ice cream maker isn’t working or stops working and you have to follow the “old-fashioned” way of making ice cream like me don’t worry cause all you have to do is freeze it and churn it every hour for three hours which can be a drag but believe me it pays off! On a sultry, hot, humid summer afternoon when you need to cool off this is the best remedy! 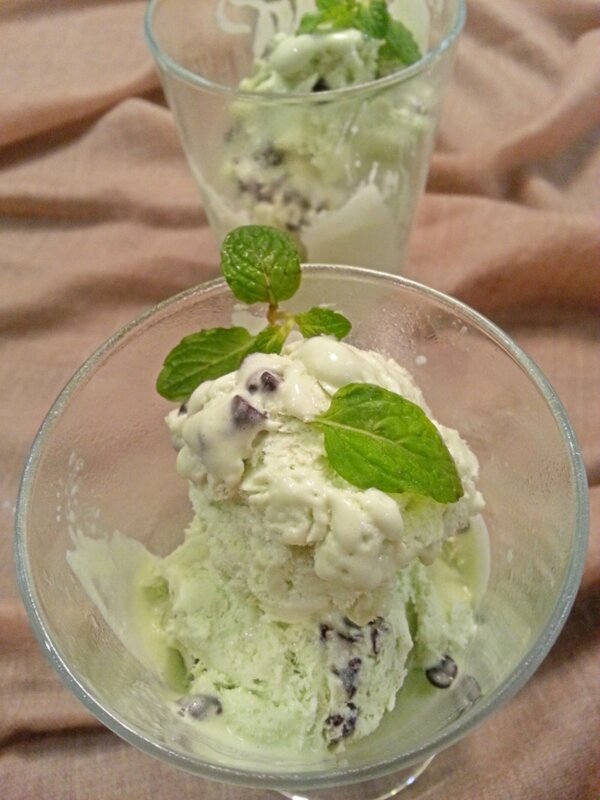 The coolness of the mint leaves added with the chillness of the ice cream and of course it is packed with wait for it CHOCOLATE CHIPS what more could you ask!!! Its time for you to lose yourself in cool carefree bliss with just a bite….. 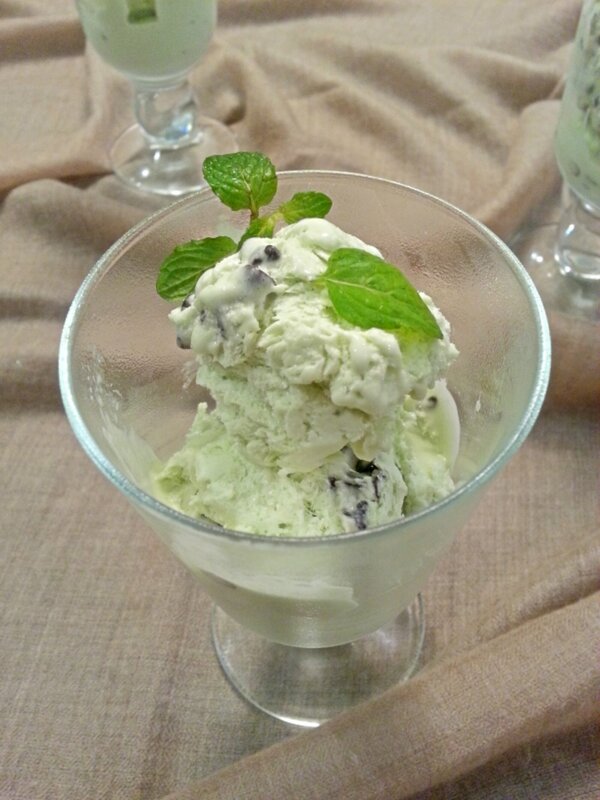 In a medium saucepan combine milk, 1 cup cream and fresh mint leaves. Heat over medium heat and bring just to a gentle bubble, about 5 minutes. Remove from heat and allow mixture to steep, 15 minutes. Meanwhile in a bowl, whisk together remaining 1/2 cup heavy cream with granulated sugar, corn syrup and egg yolks until slightly pale and fluffy, about 1 – 2 minutes. While whisking egg yolk mixture, slowly add about 1/2 cup warm milk mixture to egg yolk mixture (don’t strain leaves yet). Add egg yolk mixture to milk mixture in saucepan and return to medium heat. Cook mixture, stirring constantly until thickened, about 5 – 8 minutes (mixture should coat the back of a wooden spoon. A light bubble is fine but don’t let it boil). Remove from heat and pour mixture through a fine mesh sieve into a heat proof bowl. Using a rubber spatula, rub mint leaves back and forth in over sieve to strain oils and natural flavors from leaves into bowl, discard leaves. Mix in a few drops green and blue food colouring and mint extract (add 1/4 tsp at a time to reach desired taste). Cover with plastic wrap pressing directly against surface of mixture to prevent a skin from forming. Transfer to refrigerator and allow to thoroughly chill through, about 2 – 3 hours. Once fully chilled, process mixture in an ice cream maker according to manufactures directions, adding in chopped chocolate during last few minutes of processing. Transfer mixture to an airtight container and freeze until nearly firm (I prefer this ice cream slightly soft).